Tessa Netting is an American actress, singer and YouTuber. She got her start as a theatre artiste and performed in number of stage plays before transiting to television. The cute and bubbly star earned a lot of fame for playing Hazel Swearengen on Disney’s Bunk’d, a role that she played from 2015 to 2017. Her other acting works include Glee (2013), Nerd Court (2015), and Inappropriate Parents. Apart from acting, she is also known for hosting her own series, tesaROXX TV. Tessa also runs her own self-titled YouTube channel, on which she has over 600k subscribers. Tessa Netting was born on the 1st of September 1990, in Pottstown, Pennsylvania, United States of America. She is currently 28 years old. Place of Birth Pottstown, Pennsylvania, U.S.
Tessa Netting is one of the two children to per parents David and Leslie Netting. She has a sister named Kelsey, who is a dancer and fitness instructor. Her mother owns a dance studio called “Dance One Studios,” where she and her sister learned different forms of dance. Talking about her educational background, the stunning beauty hasn’t revealed anything about it. Not much is known about her early years. Tessa Netting has been dating comedian Joe Moses since 2012. They both first met at a Starbucks location and soon they became friends. They started dating each other in January 2012 with their relationship going strong since then. The two spend a lot of time shopping, dining and outing together and thus keeping their relationship fresh and intact. Tessa Netting first acting role was an uncredited role of a High School Student in the drama thriller, “Sins of Our Youth” in 2014. As a voice actor, she provided her voice to various characters in the 2014 animation movie, The Peanuts Movie. Tessa made her television debut with her role as Hazel on Disney Channel’s ‘Bunk’d’. She appeared in the series from 2015 to 2016. Despite having a lot a acting credits in the entertainment industry, the geek beauty is widely known for her work on the internet. As a YouTuber, she has been in the limelight since 2011. 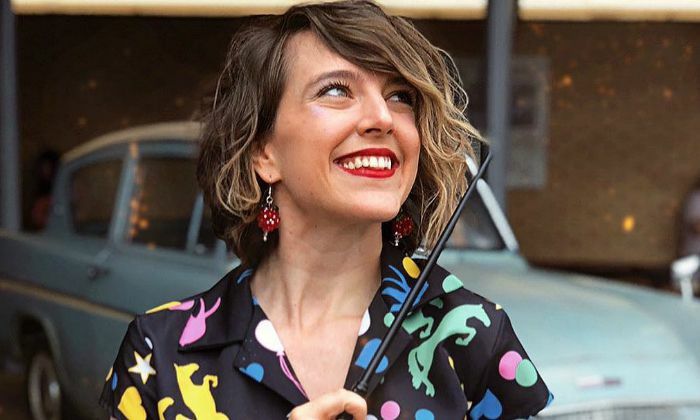 Known for her viral videos, she first gained fame with Harry Porter theme videos. She host the Fantastic Geeks podcast with her best friend Anna Brisbin, a fellow YouTuber,on Brizzy Voices channel. BlackMilk Clothing, Hot Topic and Lumos Organization. Tessa is a huge fan of Harry Potter, Doctor Who and Star Wars. She left her senior high school and moved to New York City where she began performing with theatre company called StarKid. Tessa’s acting career kick-started at the age of 17 with the Broadway production of Billy Elliot the Musical, a play that she performed in over 1,000 shows. She toured the country performing sketch comedy with Joe Moses and Curt Mega in The JoMoShow. She has been featured in Forbes, New York Magazine, Huffington Post, CBS, NBC, Playbill, and Billboard. Her online works include Skybound’s Nerd Court, Inappropriate Parents from The Fine Brothers, and hosting for Awesomness TV, DreamWorks TV, and Eli Roth’s Crypt TV. Tessa is quite popular for her parody content that she posts on her YouTube channel. The Harry Potter franchise brought her huge fame and she has also been a host for the YouTube show The Daily ReHash.